Below: Farmer’s visiting Roseworthy College c1900. Prior to formation of the Dept of Agriculture, Roseworthy was the key agriculture research and extension institution in SA. 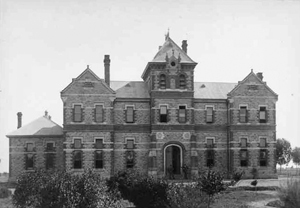 Below: Roseworthy Agricultural College main building in 1895. The Colony of South Australia was founded in 1836, under the auspices of the London-based South Australia Company. It was the only British colony in Australia that was not established as a penal settlement. Its guiding principles had been enunciated in 1829 by Edward Gibbon Wakefield: that land in any new colony should not be given away or sold cheaply but should be allocated to colonists who could afford to pay “a sufficient price”. This would, according to Wakefield, ensure a plentiful supply of farm labour because labourers would not be able to afford to buy land. Those who wished to run large numbers of sheep or cattle, rather than crop the land, would be permitted to lease it until such time as it was ripe for closer settlement. The first settlers were of British stock joined by significant numbers of Germans in the late 1840’s. None of them had much experience of farming in a Mediterranean climate similar to that which they encountered in South Australia. Some quickly found how well the vine, the olive and the oranges grew. But the story of the first 50 or so years reveals experienced farmers from temperate Europe struggling to apply the farming methods they knew so well in an unknown and quite different environment. The indigenous people had nothing to offer the new-comers since they were hunter-gatherers who tilled no land. Despite near bankruptcy in the first decade, requiring a bailout by the British Government, an economic recovery followed as a result of major mineral discoveries. The infant Colony began to prosper and qualified for the grant of responsible government by the British Crown in 1856. One of the rather negative results of the high proportion of independently minded men among the growing population in both urban and rural pursuits was the dominance of the Lower House of Parliament by political independents. Th1is led to almost continual instability in government whereby, in the 45 years between the granting of responsible government and federation, there were no less than 42 ministries, the longest term of which was six years, the shortest seven days, with most serving only a matter of months. It is against this background of slow erosion of the walls of ignorance and coming to grips with the realities of a new land; of moving out from the remote and ill-informed rule of the Colonial Office in London; and, for half a century, the political instability of the locally-based parliamentary government, that one needs to follow the largely haphazard provision of services to the rural industries by the Colonial Government of South Australia. 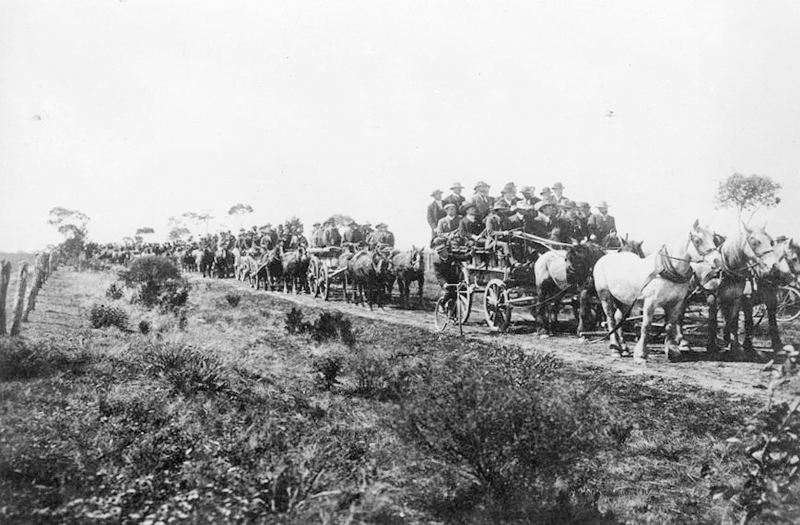 Between the foundation of the Colony in 1836 and the establishment of Roseworthy College (1883) and the Central Agricultural Bureau (1888), there is no evidence of any concerted moves to establish government agencies to foster and protect the interests of farmers and rural industries. Indeed, it is doubtful whether such a concept was even contemplated in the thinking and values of those days. From 1839, when an Act was passed to penalise the owners of stallions found straying (to the potential detriment of horse owners whose mares were intended for mating with carefully selected, superior sires), until the 1880s, a series of unrelated and largely ad hoc laws came into being which affected farmers and stockowners. Many of the early laws related to the control of stock diseases, especially scab of sheep and some cattle diseases. Provision was made for the appointment of inspectors to enforce these Acts but frequent financial crises and lack of any organisation led to faltering action and little progress. However, a concerted effort against sheep scab in 1865 led to the appointment of C.J. Valentine as Chief Inspector of Sheep. Despite an unfortunate lapse in failing to identify an outbreak of scab immediately after starting his new job, Valentine went on to greater things and became the well-respected first head of the Department of Stock and Brands (until his retirement in 1905). By 1851, weeds had come under notice, and laws were passed (Thistle and Burr Act 1862) to try to cope with the spread of scotch thistles, Bathurst burr and stinkwort but control measures were under-resourced and the legislation was full of loopholes. A well-founded Weeds Act, the Noxious Weeds Destruction Act 1891 came into being in 1891 and gave the Government power to proclaim any seriously troublesome plant as a ‘noxious weed’. It remained as the basis for weed control for 50 years. Nevertheless, programs were a mish-mash of periodic activity and non-activity, involving the Commissioner of Crown Lands, the roads authority and local councils. Insect pests did not receive much attention until the devastating effects of phylloxera on European vineyards became known, and led to the Vines Protection Act 1874. This Act provided for a ban on importing vines or parts thereof, and the addition (in 1878) of powers to appoint inspectors to enforce it. Vermin control became an issue in the 1870’s as rabbit numbers escalated. Acts were passed in 1875 and 1879 to attempt to require control measures and were followed by the Vermin Destruction Act 1882, which gave the government the power to declare ‘noxious’ any animal or bird species, introduced or native, deemed to be a pest. No structure existed or was created to ensure that concerted and managed efforts were put in train to deal with problems. Most of the inspectors designated were officers already serving in various roles as government employees who were given duties additional to their existing ones and, it seemed, everyone hoped for the best. In the early days the ministerial responsibility for rural matters generally lay with the Commissioner of Crown Lands, whose main concerns were the oversight of the Colony’s non- urban lands ─ settlement, alienation and leasing arrangements ─ as the pressures to expand farming and grazing enterprises continued. There was no Minister of Agriculture (and Education, as it happened) until Ebenezer Ward held that portfolio in 1875. It went back to Crown Lands in the following year, re-emerged in 1877, but thereafter, politically the field was considered one for Crown Lands’ administration until the 1890’s. But during the 1850’s concern began to develop within the community as to the need to improve farming methods. A new publication, Farm and Garden appeared in 1858, and survived for five years. Its editor promulgated ideas about better farming and advocated the adoption of the English system of farmers’ clubs. One was actually formed. Nevertheless an awareness was growing of the need for some organized activity to foster and maintain sound rural enterprises. A very bad outbreak of stem rust in wheat, occurring in 1867, lead to the appointment of a Royal Commission. Its report, issued in the following year, was remarkable for the soundness of its recommendations about stem rust, given the state of knowledge in those pre-Pasteur, pre-Mendel days. It also recognised that the depletion of soil phosphate by continual cropping was a key element in the decline of wheat yields. This was a significant pointer to the recognition in the community that more needed to be known about the sciences underlying agricultural production. In 1865, Surveyor General, William Goyder, defined the sensible limits of cereal cropping in South Australia by marking his famous line on maps, using ecological parameters long before the word ‘ecology’ was invented. Uninformed bureaucrats and over-enthusiastic farm developers did not always respect his work and a price was paid in the future by extending cereal cropping into marginal lands. Gradually, a sense of the need to be more objective about the development of the colony’s farming enterprises was emerging. The establishment of a Department of Agriculture, to collect and disseminate information for farmers. Appointment of a Professor of Agriculture with access to a ‘Model Farm’ near Adelaide, a laboratory for chemical analysis, a museum and a lecture hall. He would be expected, for a fee, to provide services in soil and fertilizer analysis and pest and disease identification. Establishment of experimental farms in selected locations, especially areas where new settlement was proposed. These should be required to identify and promote the most practical and economic farming systems for their regions. Improved varieties of crops, grasses and fertilizers should be sought and systematically tested. Competitions, with prizes for the best farmers, should be conducted and an annual conference of farmers held at the time of the Royal Adelaide Show. A farm school for ‘neglected’ boys should be set up to train farm labourers. All of these proposals came to fruition in one way or another except (f). Later attempts to implement this came to nothing because of a dearth of suitably motivated boys. The establishment of experimental farms had already begun in 1866-67 with their development at Manna Hill (125km north east of Peterborough) and at Millicent. These sites were selected, presumably to test farming possibilities respectively in semi-arid lands and the newly drained, high rainfall areas of the South East. The Manna Hill station survived until 1880 when severe drought caused it to be abandoned, while the enterprise at Millicent lasted a couple of years longer when decline, due to inadequate management inputs, led to its closure. The Royal Commission of 1875 soon bore fruit. John D. Custance came to South Australia in June 1881 as its first Professor of Agriculture, having received scientific training in England and serving some years on the staff of the Royal Agricultural College, Cirencester. 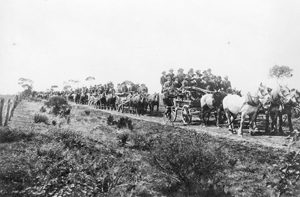 He moved to the newly-acquired farming property at Roseworthy, a few miles north of the thriving town of Gawler in early 1882. This became Australia’s first Agricultural College in 1884 and admitted its first students in the following year. It also had oversight of the experimental station at Millicent and another at Bundaleer. advocacy of superphosphate, along with crop rotations, as economic means of restoring good wheat yields on many farms. 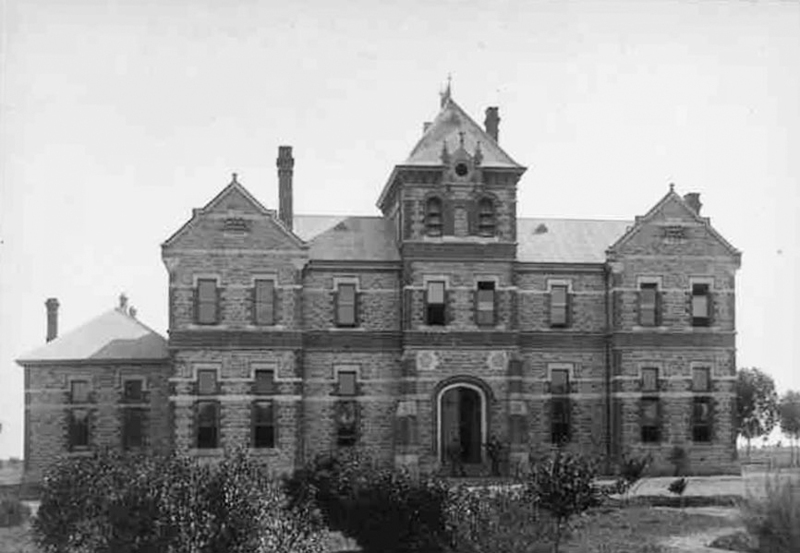 Custance remained principal of Roseworthy Agricultural College until 1887 when his appointment was terminated after some stormy exchanges with the government. He was apparently well known for his hasty temperament and often got into violent arguments with farmers. His successor, William Lowrie, a science and arts graduate of Edinburgh University, arrived at the College in 1888. He continued Custance’s important work with phosphate fertilizers and crop rotations and formed a strong partnership with Arthur Perkins, viticulturalist at the College from 1892. Working together, they were influential in getting the government to establish effective units for securing the quality of South Australia’s important butter and wine exports to the United Kingdom. These units, along with the Government Produce Department in Adelaide and the Wine and Produce Depot in London, proved highly successful in boosting the Colony/State’s reputation as an exporter not only of wine and butter but also of eggs, fresh fruit, honey, beeswax, almonds and frozen meat. In the meantime, another very important institution had been formed ─ the Central Agricultural Bureau. A Joint Parliamentary Select Committee in 1887 enquired into a vast array of matters thought to be of importance to the Colony’s agriculture. The most significant recommendation was to establish an agricultural bureau. This was the brainchild of Albert Molineux who in 1875, in effect, re-established the defunct Farm and Garden as the Garden and Field magazine. He used his publication to widely spread a great deal of information on farming and horticultural matters and also to promulgate his copious ideas on how better to educate and inform everyone about the rural economy. He envisaged a central agency of honorary members, knowledgeable in farming matters, with a paid secretary. It would be independent of government in policy formulation although having administrative responsibility to an unspecified Minister. 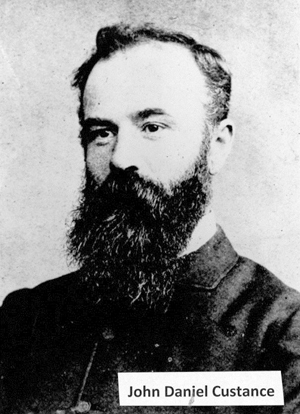 His ideas were well received by the parliamentary committee, and in April 1888 the Central Agricultural Bureau was established with a membership of six private members and four public servants: Director of the Botanic Gardens, Conservator of Forests, Inspector of Stock and Brands and the Professor of Agriculture, Molineux was the part-time secretary and published its reports as a supplement to the Garden and Field. When the work of the Bureau grew he became a full-time public servant and had to dispose of his interests in that publication, leading directly to the creation of the South Australian Journal of Agriculture. The Central Agricultural Bureau was responsible to the Commissioner (Minister) of Crown Lands, and quickly set about establishing many studies of the suitability of different crops and pasture species and varieties for local conditions. It did this through branches, each originally limited in membership to 12 farmers or orchardists. Eighteen branches were operating in the first year, rising to over 80 within seven years; by that time the limit on branch membership had been lifted to 15. These branches were in effect the first applied research and extension service available to the farmers and fruit growers of South Australia and, at low cost, they were remarkably effective. By the 1890s, Lowrie, as Principal of Roseworthy College was still active in popularising superphosphate and conducting experiments on private farms and Perkins had been appointed State Viticulturist also based at Roseworthy. The Phylloxera and the Vine, Fruit and Vegetable Acts had come into force and the Government Produce Department was flourishing. In 1894-95, for the first time since the mid 1870’s, there was a Minister of Agriculture, John A. Cockburn. The Central Agricultural Bureau bombarded him with numerous proposals for agricultural improvements as well as sponsoring increasingly widespread Bureau branches, but as John Love puts it so well in his history, “During the late nineteenth century the lines of distinction between the College, the Department and the Bureau were not at all clear”. In the following year, Cockburn refers to the seven units comprising his portfolio as, “The Department of Agriculture”. The “Journal of Agriculture and Industry” was launched to replace the Central Bureau’s publication. By now, specialist agriculture staff were being appointed outside the ambit of the Agricultural College. C.J. Valentine had begun in 1865 as inspector of sheep but by the 1890s was heading a significant Stock and Brands Department as Chief Inspector. George Quinn, in 1894 was appointed inspector of fruit and of apiaries, becoming Horticultural Inspector a few years later. A Dairy Instructor, G.S. Thompson, was appointed a few years later following the creation of the Dairy Board in July 1897. With the passing of the Fertilizers Act 1898, the Assistant Secretary of the Central Bureau (W.L. Summers) took on additional duties to carry out the inspectorial duties required by the new legislation. Many of these developments took place under the aegis of Richard Butler as Minister. By the turn of the century a small cadre of public servants were charged with responsibilities under the increasing number of statutes aimed at prevention or control of pests and diseases and the maintenance of standards for farm produce, and the materials used in agriculture. A number of specialist inspectors had been appointed but much of the work in the field was still being carried out by police officers on a part time basis. The Minister of Agriculture from 1900 to 1904 was again Richard Butler who regained the portfolio after a gap of a year or so. In 1902 he proceeded to order a major rearrangement of agricultural services by appointing A.J. Perkins as the Acting Principal and State Viticulturist at Roseworthy College, and to be Secretary of Agriculture to oversee the new structure. Butler abolished the Central Bureau of Agriculture, the Dairy Board and the College Council, replacing them by a Council of Agriculture. The new Council consisted of three members nominated by rural organisations and seven selected by the Minister. It originally had three committees to facilitate its work: Agriculture and Stock, Horticulture and Viticulture, and the Agricultural College. A fourth, the Agricultural Bureau was added in 1903-04. The Council included a number of men who had been members of the Central Agricultural Bureau so that, apart from a more evident intention to manage and coordinate agricultural services, little changed. The Agricultural Bureau branches continued to proliferate and numbered 114 in 1903-04. In that year, the Principal of Roseworthy College (J.D. Towar) resigned, and Perkins was appointed in his place. The first Dairy Instructor also resigned and was replaced by P.H. Suter. Experienced members of staff of the Agricultural College were expected to advise farmers as much as their duties allowed.